A light, ocean breeze and crystal clear waters wash away your worries as soon as you step foot onto the Skylark Negril Beach Resort. Enter into our world of laid-back beach life, rum shacks, and reggae artists, and enhance your island getaway at our spa in Jamaica. Skylark is a spa retreat in Negril that takes a simple, holistic approach to well-being, health, and happiness with a natural Jamaican style. 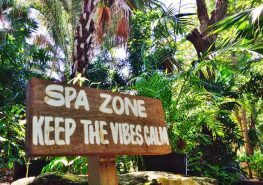 The Skylark Spa, an energetic temple overlooking the tropical gardens, features a full range of massage, foot, and beauty therapies for singles and couples. Our international spa and wellness consultant, Linda Hall, is a guru of holistic spa therapy with 35+ years of experience in the UK, Asia, US, and the Caribbean. Linda works with our certified therapists to stay current on the latest techniques, treatments, equipment, and products. She also created the award-winning Rockhouse Spa over a decade ago. 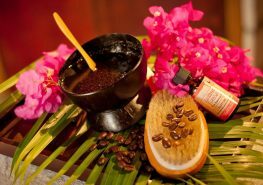 The Skylark Spa utilizes Linda’s bespoke product line, the Caribbean Essentials Spa Collection, featuring all-natural Caribbean-made products and treatments. Experience these therapeutic treatments in the Skylark Spa temple or beachside cabana. Revitalize, relax, or stimulate your senses with a massage in our cabanas as you listen to the calming sound of crashing waves. All other treatments are done in our state-of-the-art spa. CALL OR EMAIL TO SCHEDULE YOUR SPA SERVICE TODAY. Skylark’s spa treatment options can be broadened with a day trip to our sister Rockhouse Spa, featuring additional beauty and wet treatments including scrubs, wraps, and bathhouse rituals. This spa retreat in Negril is a two-time winner of the World Travel Award for Best Spa in Jamaica and is an excellent addition to your Skylark getaway. Complimentary shuttles run between Rockhouse and Skylark throughout the day. 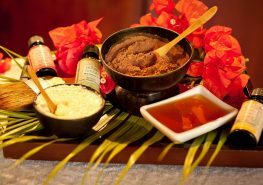 Our spa philosophy is a simple, holistic approach to wellbeing, health and happiness, with a natural Jamaican style. Book your stay at the Skylark Negril Beach Resort to complete your island getaway. 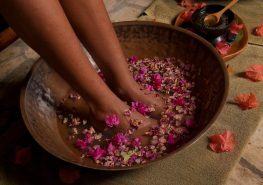 Guests begin their authentic Jamaican escape with a complimentary foot cleanse upon arrival. Our resort was designed to immerse you in our island’s culture; experience our beach vibes for yourself. Choose your room, then access our complimentary Vacation Guide to start planning. Our spa retreat in Negril awaits!